Affiliates were forced to accept predatory terms and it's important that we share this information with players. The brand is Blacklisted due to the unilateral breach of the T&C's associated with our original contract and imposing predatory terms. They've benefited from years of player referrals from us only to close our accounts because we haven't met their new quotas. Please note these unfair business practices should you proceed to play there. Needing little introduction, Gala Bingo is a household name in the world of bingo both online and offline. They are an icon in the bingo community and a true bingo star. Their popularity has grown to impressive heights throughout the years. Gala Bingo has a long history starting with nearly 200 bingo halls that are dotted across the UK. Today Gala bingo has not only a popular website but also has its own Sky TV channel and a have created a monster empire. This is a great advantage to players because Gala is in the position to offer players more than many other standalone or single bingo clubs or sites can. Online they offer even more benefits that has drawn an even larger audience than ever. There is several software integrated into one platform offers a wide range of gaming choices for players. Software include: Proprietary, Virtue Fusion (added in July 2012), IGT, Playtech, Ash Gaming, Cryptologic and Endemol Software. Gala Bingo is licensed in Gibraltar. Play bingo and have options with three variations of bingo including 90 ball, 75 ball and 80 ball bingo. Live Bingo adds a deeper dimension of real world bingo incorporating live callers. Superbooks Bingo, Free Bingo and Bingo Linked games are part of the entertainment. The moment you sign-up there is a Deposit Bonus waiting along with a spectacular array of promotional offers. The Last Chance Saloon will give players a chance to shoot up a 5p to £5 win absolutely free. Play Slot Tourneys and compete against other one arm bandit players. The top ten players win cash prizes. 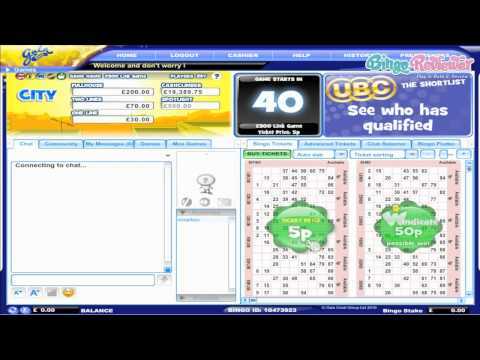 Chat Games offer players prizes while competing against other players while playing bingo room. The VIP players have their own exclusive promotions. There are 4 levels of VIP that offer Birthday Bonuses, VIP of the week and Deposit Bonuses. Earn Buzz Points every time you play for real cash and once 500 points are collected redeem for Cash Bonuses. Gala Bingo is a veteran in the bingo industry and is only fair to say they are highly knowledgeable in knowing what players want and need and achieve it with ease. We rate Gala Bingo with 4 Pink Hearts. I started playing gala again, because they are doing nectar points now. You get 2 points for every £1. It's great that they list the game times and prices and that it's easy for you going around different rooms. Plus you can buy your tickets in advance so that you could do other things in between. This is actually one of my favorite bingo sites. Easy navigation and the layout is not confusing. You can see all the games that is coming up, with times and prices, so that you can play immediately and play the cheapest games too. I love the Island games from 8pm to 10pm, you could win for only 2p! I've been on the site for like 3 months, and I've won a little bit every week, all for 2p or 5p! I play at Gala for the Nectar points, it's great to have when I shop at Sainsbury :) And for every £1 you spend you get 2 nectar points. But you have to register your nectar card first to avail of the points! I highly recommend Gala. It's not just the variety of games they have on site, but also the people. The members are very helpful and friendly, the site is great and easy to find your way around, and they have great prizes as well! I like the bingo games on Gala, but that's not what keeps me going back. I love the fact that they have other games like blackjack and poker. But one of their most addictive is monopoly and their dice games. Lots of free games on Gala! With the more than 4000 free games, you stand a better chance at winning in some of them :) From the free games alone, I won about £100 just this month. BingoReviewer has set up an exclusive £35 free bonus on your first £10 deposit. That is an extra 5 quid on top of their regular offer! First thing I have noticed about this site is the fact that they have a mobile site, and you can access it and play using any portable device like a smartphone or a tablet. Those with iOS or Android can download apps specially designed for those platforms. The site is good looking and but stills stays on the simple side, and I found navigation to be really simple and intuitive. They accept all the well known depositing methods, including PayPal, Skrill and Neteller. They offer a trully impressive game selection, a total of 21 rooms with 75, 80 and 90 ball games, and that is really great, for all those who find the regular offer not good enough. Further on, they have almost 150 different slot games, almost 200 Vegas games, and even some other games, so it will be really hard to get bored. All the games are powered by Electrade games, and although I haven't really heard or played those games before, I am thrilled with the choice. Free Spins are the spins that don’t require you to subtract funds from the remaining balance, but once they are successful, they add to coins to it. Enjoy the list of casino slots with free spins feature they can bring the biggest wins. Run every day between 9am and mid night. Great jackpots too.